Attention: The Gun Permits Office will close early Tuesday, April 30, 2019 at 5:00pm in order to change out software. We are normally open on Tuesdays till 8:00pm but will closed early. ***SCAM ALERT*** We DO NOT call persons by phone and tell them to pay us money using prepaid cards so the Sheriff’s Office can dismiss any warrants due to you not showing up for jury duty or any other circumstances. Regardless of what you are being told by phone, we do not conduct business that way. BEWARE of any phone calls asking for money over the phone. Our main telephone number is 704-869-6800. When in doubt, give us a call. *We have added a new service called “Safe Child Exchange.” A deputy is on site from 3:30pm to 8:30pm each day in our lower back parking lot (Walnut Ave). The area is marked with yellow paint. No appointment necessary. *The month of March, 8- Law Enforcement Officials and 0- K9’s were killed or died in the line of duty for the United States of America. * The 2019 year total of Law Enforcement Officials killed and Died in the line of duty to 29. Welcome to the Gaston County Sheriff’s Office website. It is my honor to be Sheriff and serve the people of Gaston County since 2004. I hope that you find this website helpful and informative. We at the Gaston County Sheriff’s Office will always work hard to be professional and efficient in performing our duties for Gaston County. We are proud to be a part of our community in participating during events, assisting non-profit organizations and the less fortunate throughout the year. I always encourage my employees to be a part of their community and give back to make a positive impact in someone’s life. 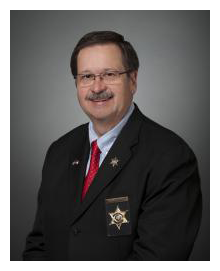 I look forward of being Sheriff again for another 4 years striving to make Gaston County a safer place. The Gaston County Jail’s inmate phone system is hosted by ICSolutions. When an inmate calls you from our facility you will hear a voice prompt letting you know that an inmate from the Gaston County Jail is trying to call.